To a listener today the Missa Coronationalis seems to be the most concise and concentrated of all the composer's masterpieces. The Mass was first performed on June 8, 1867 at the coronation ceremony in the Matthias Church by Buda Castle in a six-section form. After the first performance the Offertory was added, and two years later the Gradual. "First of all I must apologize from a musical point of view for the unusual simplicity of the mass; it was impossible for me to evade my prior instructions to keep it as short as possible and so abandoned a larger scale work. Despite that, I hope the work's two main characteristics - its ecclesiastical and its Hungarian national aspect - can plainly be seen. You will, by the way, see how careful I have been to make sure that the performance should under all circumstances be exceptionally light and smooth. The vocal parts are kept within their most comfortable registers and the instruments accompanying them also play in their most comfortable positions. I have renounced enharmonice so as to prevent all dissonance, I have restricted myself to the customary devices and forsworn all offensive instruments, various percussion effects, bass clarinets or other innovations; I was not able even to include a single harp. 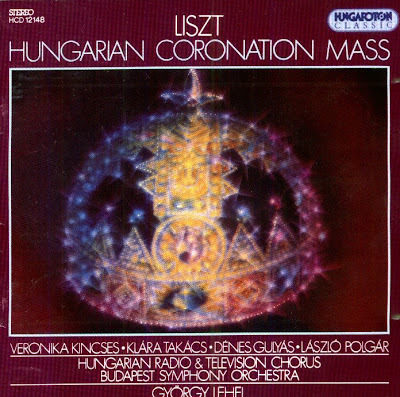 In short, the mass is built up in such a way that it can be well sung and performed at sight ..."
The CD was released by Hungaroton Classic, 1994, (DDD). Hungaroton Classic HCD 12148.